The Listed Property Show is a two day event where you can gather more information and expert advice in one weekend than you can through months of personal research! And Earthborn will be there, at London Olympia on Saturday 9th & Sunday 10th February 2019. Join us on stand D17 for paint demos, technical help, colour advice and a very exciting first look at our BRAND NEW colours! It’s a great opportunity to meet the biggest collection of listed building suppliers and experts under one roof. 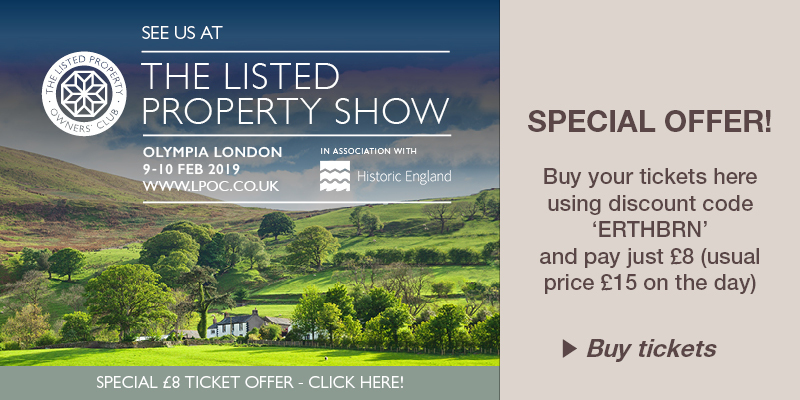 So if you are maintaining, altering or renovating your listed home – or even looking to buy one – The Listed Property Show is not to be missed! PLUS click here to get your tickets for just £8.00 instead of the usual £15.00 on the door, by using the discount code ‘ERTHBRN’.